Summary: In a world where everybody has the ability to control quartz, machinery and (of course) Mechas are all made of quartz. But there are very few who couldn't, called "unsorcerers". One of these unsorcerers, Rygart Arrow unknowingly became the key to survival of the Kingdom of Krisna. First Impression: Um, there isn't a "first" impression consider this isn't actually new. They literally cut up the original six-episode movies, which is about one hour each, into 12 episodes, slap on some inferior opening and ending theme songs (seriously, the original Broken Blade theme songs are of my all time favorite anime songs. Track 14 in my Anime Music Jukebox top right corner of the blog, if you are curious, Fate by KOKIA) to make a TV series out of it. Personal Opinion: Broken Blade is probably my most favorite Mecha anime of all time. Personally, I'm not a big fan of Mecha animes, because one, they're a logically flawed concept: it's really hard to argue Mecha is the most efficient form of ultimate combat machinery because of physics, aerodynamic, and many other factors; and two, it seems all Mecha story involves some pilot who by screaming and stomping on the paddle harder could suddenly make the Mecha to push harder, fly faster, and lift more. 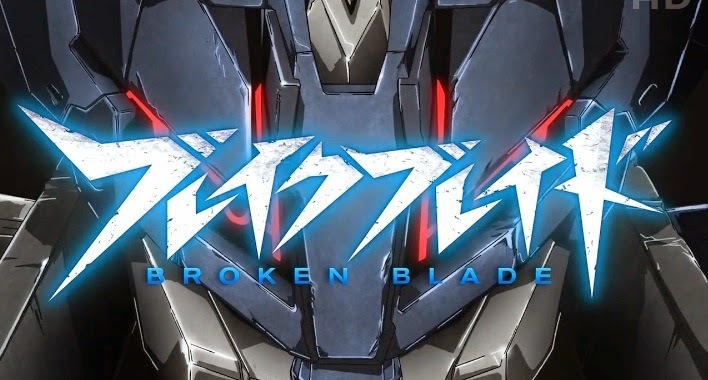 Broken Blade, however does not have these common pitfalls Mecha animes generally all have--there are actual legitimate reasons for why Mecha is used and why pilot pushing harder could actually make the Mecha push harder. It's one of the very few Mecha animes that actually makes logical sense. On top of that, it is just a very well made anime that managed to blends action, plot, and interesting characters all together. If you have seen Broken Blade movies, then there's nothing new to be seen here. If you haven't seen Broken Blade movies, you could either wait out 12 week to see the TV series, or just grab the movies (which have a lot better theme songs) and watch those. Either way, Broken Blade is probably one of the best Mecha animes ever made. You shouldn't miss it. Yaaaay Evil Cat's Glorious return! You seriously have a knack for saving me time and trouble. Return to make just one post, and immediately it saves me the trouble of lining this show up for examination and posts. I was kind of "ehhh...more Broken Blade? You're risking messing up a good thing...it better be well done..."
I suppose that's business logic for ya, take the safe route, just MAKE THE SAME THING TWICE. THEN THRICE. Then milk that cash cow till the udders fall off! BUSINESS. I don't know if a remake to milk money is worse than a poorly executed sequel. I've seen such horrible things of both. Never-the-less, it's great to have you pop in again Evil Cat, even if just for a moment.